angels and halos | A Veil of Enlightenment! Enter your email address to follow A Veil of Enlightenment and receive notifications of new posts via email. 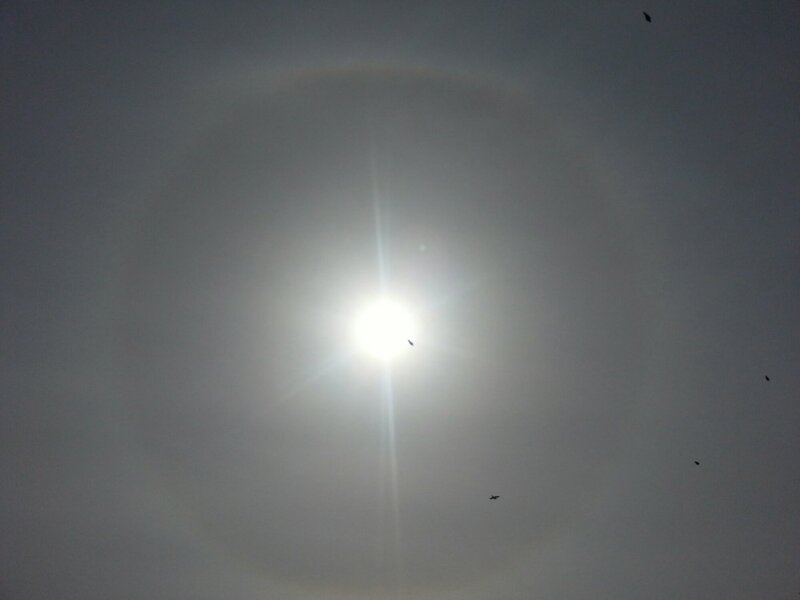 Circle or “Halo” Rainbow Captured! 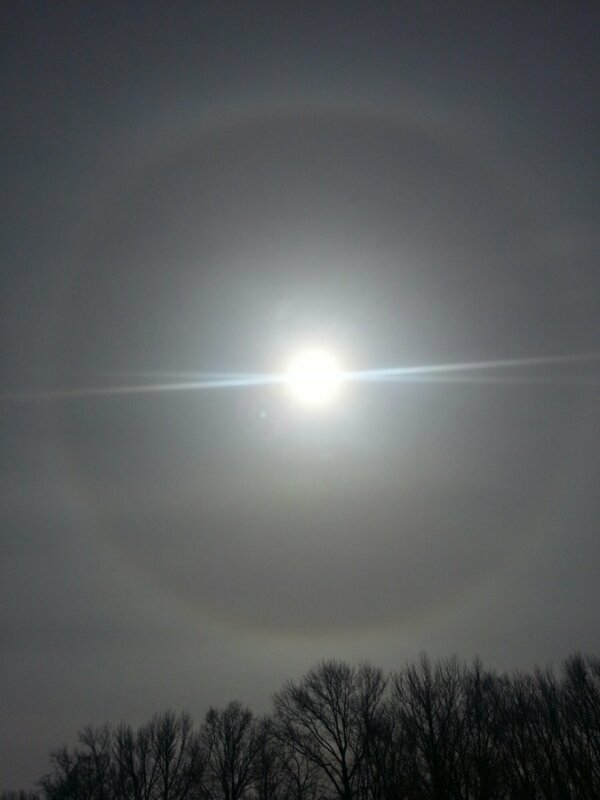 A perfect circle or “halo” rainbow with sun and rays in the dead center to enhance it! Being one extremely interested in rainbows and their meanings, I had read some time ago that rainbow arcs we usually see in the sky are actually part of a rainbow. A rainbow is actually a circle! Well this was a new one on me! Then yesterday as I photographed the sun around noonish, I noticed rainbow colors slightly above the sun’s extended rays. 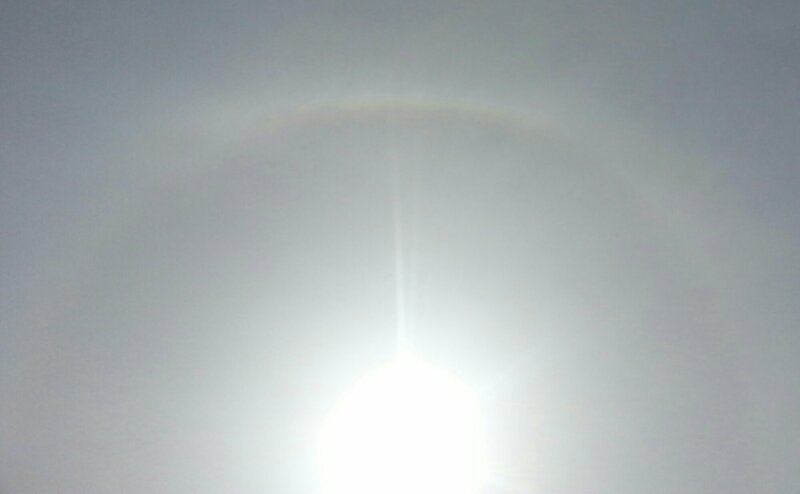 I stepped back to attempt to capture it and that’s when I realized I was staring at a humongous circle rainbow with the sun dead in the center of it! I kept backing up trying to captured this rare phenomenon, for me at least it was, all the while staring awe- struck at the sheer size of it! It was directly over my house and backyard! 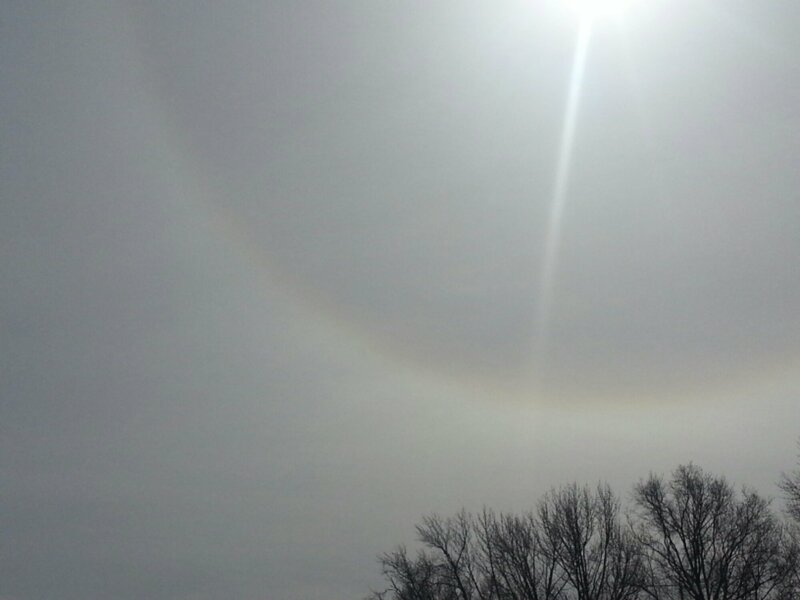 This shows the sheer size of the halo rainbow before I started backing up to capture it all! Later I went in to review my photos and was thrilled to have captured this magical work of nature fully in several photos. Being the type of person who has to know the meaning/symbolism behind occurrences, I looked up circle rainbows. I loved the name “halo” rainbow because it seems to symbolize angels and to me this halo rainbow symbolized the uniting of all the many people my families have lost coming together as one to tell me they are okay up there! It made my heart and soul feel warm and happy to make this connection. 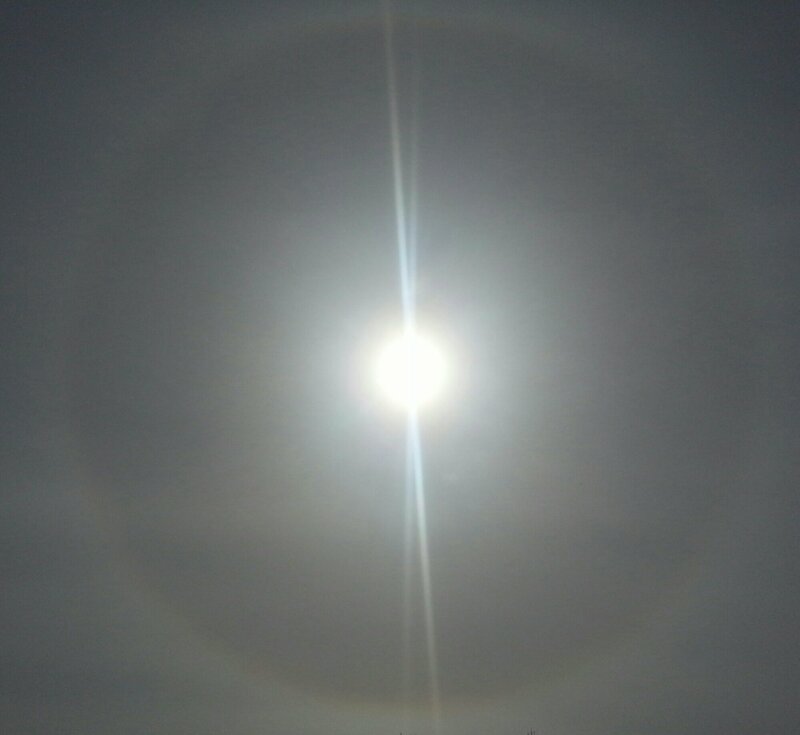 I tried to capture different angles of the sun in the halo rainbow. Now of course I know that these rare rainbows are created from ice crystals being hit by sunlight, but as I go out several times a day every day to photograph the natural world around me, why haven’t I seen one sooner? Why was it that when I was feeling extremely low in my life and had beseechingly been asking for a rainbow the day prior that all of a sudden out of the blue, I get to witness the most amazing type of rainbow imaginable? Someone up there knew I was in need of a special sign. This rainbow was it. I spent the rest of the day floating on air feeling so much better about life! I see this rainbow as a magnificent gift from above! Think what you will about its sudden appearance, but for me it came at a time I needed it the most! See the rainbow colors running along the top of this circle rainbow? Here the sun even looks like a star in the center! Sophia Valentine Blogger & Author Phenomenon! Interview with Author Alisha Cole! J. Haney ‘s New Release! Followers of A Veil of Enlightenment! Follow A Veil of Enlightenment Through Email! Follow A Veil of Enlightenment! Join Our Growing Community! Romance to satisfy your every need.